Robert Louis (Balfour) Stevenson (November 13, 1850 – December 3, 1894) was a Scottish novelist, poet, and travel writer, and a leading representative of Neo-romanticism in English literature. He was responsible for two of the most popular works of American literature, Treasure Island and The Strange Case of Dr. Jekyll and Mr. Hyde (1886). The former is one of the most popular children's stories about pirates and buried treasure. The latter is a novella about a dual personality much depicted in plays and films, also influential in the growth of understanding of the subconscious mind through its treatment of a kind and intelligent physician who turns into a psychopathic monster after imbibing a drug intended to separate good from evil in a personality. The depiction of Jekyll and Hyde is rich in symbolic resonances, representing the intersection of a number of influences and discourses. The novel is part religious allegory, part fable, part detective story, part science fiction, part doppelgänger narrative, and part Gothic fiction. Stevenson was the man who "seemed to pick the right word up on the point of his pen, like a man playing spillikins," as G. K. Chesterton put it. He was also greatly admired by many authors, such as Ernest Hemingway, Rudyard Kipling, Vladimir Nabokov, and others. Most modernist writers dismissed him, however, because he was popular and didn't write within their narrow definition of literature. It is only recently that critics have begun to look beyond Stevenson's popularity and allow him a place in the canon. Stevenson was born Robert Lewis Balfour Stevenson (when Stevenson was around 18 years old he changed the spelling of "Lewis" to "Louis") in Edinburgh, Scotland, on November 13, 1850. His father was Thomas Stevenson, and his grandfather was Robert Stevenson; both were distinguished lighthouse designers and engineers, as was his great-grandfather. It was from this side of the family that he inherited his love of adventure, joy of the sea and for the open road. His maternal grandfather, Lewis Balfour, was a professor of moral philosophy and a minister, and Stevenson spent the greater part of his boyhood holidays in his house. "Now I often wonder," says Stevenson, "what I inherited from this old minister. I must suppose, indeed, that he was fond of preaching sermons, and so am I, though I never heard it maintained that either of us loved to hear them." From his mother, Margaret Balfour, he inherited weak lungs (perhaps tuberculosis), that kept him constantly in "the land of the counterpane" during the winter, where his nurse spent long hours by his bedside reading from The Bible, and lives of the old Covenanters. During the summer he was encouraged to play outside, where he proved to be a wild and carefree child. By the age of eleven his health had improved so that his parents prepared him for the University of Edinburgh by enrolling him in Edinburgh Academy, planning for him to follow in his father's footsteps as a lighthouse engineer. During this period he read widely and especially enjoyed William Shakespeare, Walter Scott, John Bunyan, and The Arabian Nights. The next four years were spent mostly in travel, and in search of a climate that would be more beneficial for his health. He made long and frequent trips to Fontainebleau, Barbizon, Grez, and Nemours, becoming a member of the artists' colonies there. He made frequent trips to Paris, visiting galleries and the theaters. It was during this period he first met his future wife, Fanny Vandegrift Osbourne, and made most of his lasting friends. Among these included Sidney Colvin, his biographer and literary agent, William Henley, a collaborator in dramatic composition; Mrs. Sitwell, who helped him through a religious crisis; Andrew Lang, Edmund Gosse, and Leslie Stephen, all writers and critics. He also made the journeys described in An Inland Voyage and Travels with a Donkey in the Cevennes. In addition, he wrote twenty or more articles and essays which appeared in various magazines. Although it seemed to his parents he was wasting his time and being idle, he was in reality constantly studying to perfect his style of writing and broaden his knowledge of life, emerging as a man of letters. When Stevenson and Fanny Vandegrift met in France in 1876, it was love at first sight. A few months later when she returned to her home in San Francisco, California, Stevenson was determined to follow when he learned that she was sick. His friends advised against the journey; knowing his father's temper, he sailed without even notifying his parents. He took steerage passage on the Devonian in part to save money but also to learn how others traveled, and to increase the adventure of the journey. From New York City he traveled overland by train to California. He later wrote about the experience in An Amateur Emigrant and Across the Plains. Although it was good experience for his literature, it broke his health, and he was near death when he arrived in Monterey. He was nursed back to his feet by some ranchers there. In December 1879, he had recovered his health enough to continue to San Francisco, where for several months he struggled "all alone on forty-five cents a day, and sometimes less, with quantities of hard work and many thoughts," in an effort to support himself through his writing; but by the end of the winter his health was broken again, and he found himself at death's door. Vandegrift—now officially divorced from her husband and recovered from her own illness—came to Stevenson's bedside and nursed him to recovery. "After a while," he wrote, "my spirit got up again in divine frenzy, and has since kicked and spurred my vile body forward with great emphasis and success." When his father heard of his condition he cabled him money to help him through this period. In May 1880, he was married, when, as he said, he was "a mere complication of cough and bones, much fitter for an emblem of mortality than a bridegroom." With his new wife and her son, Lloyd, he went into the mountains north of San Francisco in Napa Valley, spending a summer honeymoon at an abandoned mining camp; this experience he published in The Silverado Squatters. At one point he met Charles Warren Stoddard, co-editor of the Overland Monthly and author of South Sea Idylls, who urged Stevenson to travel to the south Pacific, an idea which would return to him many years later. In August 1880, he sailed from New York with his family back to Great Britain, and found his parents and his friend Sidney Colvin, on the wharf at Liverpool happy to see him return home. Gradually his new wife was able to patch up differences between father and son and make herself a part of the new family through her charm and wit. For the next seven years, between 1880 and 1887, Stevenson searched in vain for a place of residence suitable to his state of health. He spent his summers at various places in Scotland and England; for his winters, he escaped to sunny France, living at Davos-Platz and the Chalet de Solitude at Hyeres, where, for a time, he enjoyed almost complete happiness. "I have so many things to make life sweet for me," he wrote, "it seems a pity I cannot have that other one thing—health. But though you will be angry to hear it, I believe for myself, at least, that is best. I believed it all through my worst days, and I am not ashamed to profess it now." In spite of the blood on his handkerchief and the medicine bottle at his elbow, his optimistic spirit kept him going, and he produced the bulk of his best known work: Treasure Island, his first widely popular book; Kidnapped; The Strange Case of Dr. Jekyll and Mr. Hyde, the story which established his wider reputation; and two volumes of verse, A Child's Garden of Verses and Underwoods. On the death of his father in 1887, Stevenson felt free to follow the advice of his physician to try a complete change of climate. He started with his mother and family for Colorado; but after landing in New York, they decided to spend the winter at Saranac Lake, in the Adirondacks. During the intensely cold winter Stevenson wrote a number of his best essays, including Pulvis et Umbra, he began The Master of Ballantrae, and lightheartedly planned, for the following summer, a cruise to the southern Pacific Ocean. "The proudest moments of my life," he wrote, "have been passed in the stern-sheets of a boat with that romantic garment over my shoulders." In June 1888, Stevenson chartered the yacht Casco and set sail with his family from San Francisco. The vessel "ploughed her path of snow across the empty deep, far from any hand of help." The salt sea air and thrill of adventure for a time restored his health; and for nearly three years he wandered the eastern and central Pacific, visiting important island groups, stopping for extended stays at the Hawaiian Islands, where he became a good friend of King David Kalakaua, with whom Stevenson spent much time. Stevenson also became best friends with the king's niece, Princess Victoria Kaiulani, also of Scottish heritage. They also spent time at the Gilbert Islands, Tahiti and the Samoan Islands. During this period he completed The Master of Ballantrae, composed two ballads based on the legends of the islanders, and wrote The Bottle Imp. The experience of these years is preserved in his various letters and in The South Seas. In 1890, he purchased four hundred acres of land in Upolu, one of the Samoan Islands. Here, after two aborted attempts to visit Scotland, he established himself, after much work, upon his estate, which he named Vailima ("Five Rivers"). His influence spread to the natives who consulted him for advice, and he soon became involved in local politics. He was convinced the European officials appointed to rule the natives were incompetent, and after many futile attempts to resolve the matter, he published A Footnote to History. This was such a stinging protest against existing conditions that it resulted in the recall of two officials, and Stevenson feared for a time it would result in his own deportation. When things had finally blown over, he wrote a friend, "I used to think meanly of the plumber; but now she shines beside the politician." In addition to building his house and clearing his land and helping the natives, he found time to work at his writing. In his enthusiasm, he felt that "there was never any man had so many irons in the fire." He wrote The Beach of Falesa, David Balfour, and Ebb Tide, as well as the Vailima Letters, during this period. For a time during 1894, Stevenson felt depressed; he wondered if he had exhausted his creative vein and completely worked himself out. He wrote that he had "overworked bitterly." He felt more clearly, with each fresh attempt, that the best he could write was "ditch water." He even feared that he might again become a helpless invalid. He rebelled against this idea: "I wish to die in my boots; no more land of counterpane for me. To be drowned, to be shot, to be thrown from a horse—ay, to be hanged rather than pass again through that slow dissolution." He then suddenly had a return of his old energy and he began work on Weir of Hermiston. "It's so good that it frightens me," he is reported to have exclaimed. He felt that this was the best work he had done. He was convinced, "sick and well, I have had splendid life of it, grudge nothing, regret very little … take it all over, I would hardly change with any man of my time." Without knowing it, he was to have his wish fulfilled. During the morning of December 3, 1894, he had worked hard as usual on Weir of Hermiston. During the evening, while conversing with his wife and straining to open a bottle of wine, he suddenly fell to the ground, asking "What's the matter with me? What is this strangeness? Has my face changed?" He died within a few hours, probably of a cerebral hemorrhage, at the age of 44. The natives insisted on surrounding his body with a watch-guard during the night, and on bearing their Tusitala (Samoan for "Teller of Tales") several miles upon their shoulders to the top of a cliff overlooking the sea, where he was buried. Stevenson was a celebrity in his own time, but with the rise of modern literature after World War I, he was seen for much of the twentieth century as a writer of the second class, relegated to children's literature and the horror genre. Condemned by authors such as Virginia Woolf and her husband, Leonard Woolf, he was gradually excluded from the canon of literature taught in schools. His exclusion reached a height when in the 1973, 2,000 page Oxford Anthology of English Literature, Stevenson was entirely unmentioned. The late twentieth century saw the start of a re-evaluation of Stevenson's works as an artist of great range and insight, a literary theorist, an essayist and social critic, a witness to the colonial history of the South Pacific, and a humanist. He is now being re-evaluated as a peer with authors such as Joseph Conrad (who Stevenson influenced with his South Seas fiction) and Henry James, with new scholarly studies and organizations devoted to his work. No matter what the scholarly reception, Stevenson remains very popular. According to the Index Translationum, Stevenson is ranked the 25th most translated author in the world, ahead of Charles Dickens, Oscar Wilde, and Edgar Allan Poe. Treasure Island (1883) His first major success, a tale of piracy, buried treasure, and adventure, has been filmed frequently. It was originally called The Sea-Cook. Its most famous character, Long John Silver, is the namesake of a United States-based restaurant chain. The Wrong Box (1889)—co-written with Lloyd Osbourne. A comic novel of a tontine, also filmed (1966). A tontine is a group life-insurance policy in which all the benefits go to the last survivor. Both in the novel and in real life, it is an incentive to murder, and no longer legal in most countries. 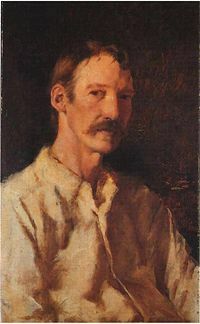 St. Ives: being the Adventures of a French Prisoner in England (1897)—unfinished at the time of Stevenson's death, the novel was completed by Arthur Quiller-Couch. Island Nights' Entertainments (aka South Sea Tales) (1893)—contains The Beach of Falesa, The Bottle Imp, and The Isle of Voices. "The Body Snatcher" (1884), an influential horror tale, first published in the Christmas 1884 edition of the Pall Mall Gazette. A Child's Garden of Verses (1885), written for children but also popular with their parents. Includes such favorites as "My Shadow" and "The Lamplighter." Often thought to represent a positive reflection of the author's sickly childhood. Although not well known, his island fiction and non-fiction is among the most valuable and collected of the nineteenth century body of work that addresses the Pacific area. Stevenson also wrote poetry and prose in Scots. Stevenson was an amateur composer who wrote songs typical of California in the 1880s, salon-type music, entertaining rather than serious. A flageolet player, Stevenson had studied harmony and simple counterpoint and knew such basic instrumental techniques as transposition. Some song titles include "Fanfare," "Tune for Flageolet," "Habanera," and "Quadrille." Robert Hughes in 1968, arranged a number of Stevenson's songs for chamber orchestra, which went on a tour of the Pacific Northwest in that year. ↑ Stephen Arata, "Robert Louis Stevenson" in David Scott Kastan, ed., The Oxford Encyclopedia of British Literature, Vol. 5: 99-102. Bowman, James Cloyd. An Inland Voyage and Travels with a Donkey. 1918. O'Brien, Robert. This is San Francisco. Chronicle Books, 1994. Works by Robert Louis Stevenson, at The Online Books Page. Works by Robert Louis Stevenson. Project Gutenberg. 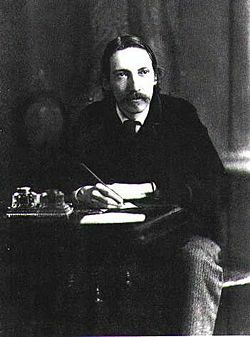 151 poems by Robert Louis Stevenson, at Poetry Archive. "Henry David Thoreau: His Character and Opinions", by Robert Louis Stevenson. Free audiobook of Treasure Island from LibriVox. Free audiobook of "The Cow" from LibriVox. Full text of Robert Louis Stevenson: a record, an estimate, and a memorial, by Alexander H. Japp. Full text of the biography Robert Louis Stevenson by Sir Walter Raleigh. Biography from the Dictionary of Literary Biography, 1987. The bell rock lighthouse and the Stevenson : the history of an old sea tower and a family of engineers. History of "Robert Louis Stevenson"